Digital Nerve Injury in Mesa, Chandler, Gilbert, Tempe, and Phoenix | Gerald L. Yospur, M.D. History and physical alone exam can generally determine if a nerve has been damaged as well as pin point the location. The digital nerves are composed of a network of small nerves that receive information from the fingertips and hands and send that information up the arm to the brain. These nerves run down the side of each finger. They are extremely important to daily life, because our hands provide us with so much information about the outside world. The digital nerves allow us to sense temperature, vibrations, texture, moisture, and other things about our environment. They can be damaged through any type of trauma ranging from small cuts to motor vehicle accidents. Treatment depends on location and severity. For clean cuts that receive immediate treatment, a direct repair may be performed. For deeper or older injuries, the nerve endings may be retracted within the tissue. In these more complex cases, a nerve graft may be required to repair it. Injured or severed digital nerves will not heal without treatment. If left alone, the nerve endings can form painful and highly-sensitive neuromas, and finger sensation may be completely gone. Regardless of the type of repair, post-op hand therapy is common, with exact therapy timeline depending on injury/surgery. A general therapy course is described below. Approximately one week after surgery, the bulky dressing will be removed. Compressive gloves, fingersocks, or dressings may be applied for swelling management. Sutures will be removed 10-14 days after surgery. A custom splint will be fabricated and placed on your hand to protect the incision and stabilize the repair while it heals. You should wear this at all times, day and night. Keep your hand elevated about the level of your heart when possible to minimize swelling. You should move your UNINVOLVED fingers frequently (within the confines of the splint) to prevent unnecessary stiffness. Tell your doctor or therapist if you feel any significant pain or swelling in your fingers. Your therapist will give you special exercises to perform with your repaired finger, where you use your opposite hand to passively move the finger. Follow this program daily, exactly as instructed. It is important that you continue wearing the splint at all times, until instructed otherwise. Wear it day and night to protect the thumb. Manual techniques will be initiated to help control swelling and prevent scar adhesions. Your therapist will show you different methods to gently mobilize the scar tissue as part of your home program. 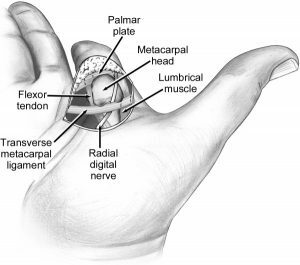 Various other therapeutic techniques may be utilized to maximize your finger motion, prevent complications, and expedite the healing process. Your home program will be upgraded to include active movement of your finger. Follow your therapist’s instructions and the exercise program provided to you. Continue wearing your splint as instructed; it may be adjusted to allow slightly more movement. You should not have to remove it to complete the exercises. Around this time, you can expect your doctor/therapist to gradually decrease your splint wear. You should continue wearing it at night, until instructed otherwise. If severe stiffness persists, your therapist may use other splinting methods to facilitate full range of motion. Strengthening may begin; follow your therapist’s guidelines. Strengthening and exercises will have been upgraded throughout this time. Follow your doctor/therapist’s instructions about return to daily activities. Ask your doctor if you intend to return to sports or strenuous work or other hand-intensive activities. The timeline for sensation return will vary, but keep your therapist updated anytime your sensation changes or improves. Therapy will involve sensory re-education techniques, however because sensation often takes many months to return, your therapist may give you instructions on a “home program” to complete on your own to encourage normal sensitivity.